Give Your Carpets The Deep Cleaning They Need! Download our FREE eBook guide to learn how owning a stick vacuum can make you fall in love with cleaning, with it's power and portability, but without the noise. ​​When it comes to knowing how to clean engineered hardwood floors, it can be an easy task. But, its vital to know what to use to keep from damaging your floors. There are various light cleaning and deep cleaning choices out there to select from. We’ll go through and review how to clean engineered hardwood floors, in a way that keeps them safe and free from damage. ​Before you can begin cleaning, you need to identify (and ensure) that you have engineered wood floors. The biggest difference between engineered wood floors and real hardwood floors are hidden in the layers of the flooring. Real hardwood floors are pure wood all the way through. Engineered wood floors are typically real wood on the top, usually protected by a protective treatment layer. Below the wood are two to three layers of plywood. This added layer helps deter moisture accumulated damage that can develop in humid areas, along with making the construction cheaper. Each layer is positioned in a different direction so that the flooring won't warp or bow if it gets wet. Engineered flooring has only been around since the 1960's, so chances are you won't find this type of wood when you pull old carpets up. If you are unsure whether your wood floor has a finish then you can find out with a simple test. Put a small drop of water on your wood floors. If the water beads up then your floors have a finish. If the water soaks in to the floor and leaves a dark wet spot, then there is no finish. All engineered hardwood floors will have a finish, unless it has been severely damaged and the finish has been stripped away. Any questions or concern you have about your engineered hardwood floors can be directed to the manufacturer or store that you purchased them from. You need to know your specific floor type before you begin cleaning. If you put the flooring in yourself, then you should speak to the company to find out which commercial chemical cleaners will be okay to use. For ​example, you have to use a specialized vacuum that works on hardwood flooring, as you don't want to scratch your engineered floors. The best way to clean engineered hardwood floors starts with not having to deep clean ​the flooring, if possible. Caring for your engineered flooring daily and weekly will prevent having to use strong (and possibly harmful) chemicals to clean. If you are unable to clean your floors daily, then try to focus on the main high traffic areas such as doorways and hallways. You may not need to sweep your entire floor everyday, but these areas will need the most attention to cut down on dirt buildup. With that being said, there will probably come a time when you do need to deep clean your engineered hardwood floors. When it comes to the thin protective layer on your floors, you will want to protect it by using gentle cleaning techniques. ​Dirt, sand and small grain debris is a wood floors worse enemy. These small particles sit on your floor and will sand down the floor’s finish. 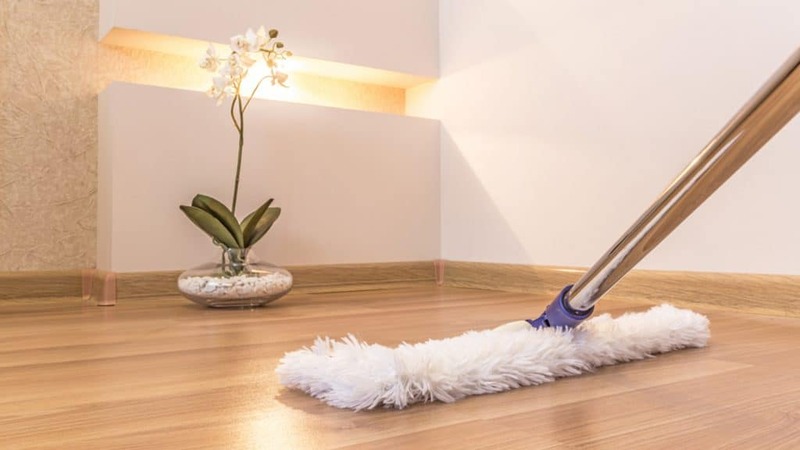 A standard broom or vacuum designed for laminate floors are easy to use for daily cleaning. If you opt for a stick vacuum, make sure the hard floor setting is on or use a hose attachment. You want to avoid the bristles rotating on your floor as this can lead to scratches and scuffs on the floor. There are also specific floor made vacuums and brooms whose bristles won’t harm your wood floor. Also, take a look at the top rated canister vacuum on the market. Because of their unique design, canister vacuums are very convenient to use on engineered flooring, and also designed not to damage them. ​Small spills should be cleaned up as soon as possible with a damp rag or damp paper towel. Do NOT let any spill sit on your floor for an extended period of time. The very top portion of your flooring is wood, and longstanding moisture will cause permanent damage. No chemicals or cleaners are needed if the spill is recent. Simply wipe it up and you should be fine. You might need to use a little bit of elbow grease, but nothing more. When learning how to clean engineered hardwood floors, many make this mistake and use a cleaner that damages their flooring. Spills often happen in a moment of panic, and the quick reaction is to pull out a chemical cleaner. Don't do this. Certain cleaners utilize heavy (and destructive) chemicals. They clean well... but they can also leave your engineered flooring in bad shape. ​As mentioned before, you will want to know your type of engineered hardwood floor. Specifically, the finish, before you start pouring any cleaners on it. If you do not know anything about where your floors came from, then you should consult with an engineered hardwood floor expert. This might seem like an out-of-the-way step, but not all hardwood floor cleaners are made for your type of flooring. The wrong cleaner could damage or strip away the protective finish. It won’t happen right away, but over time your floors will lose their longevity and begin to dull and take on damage. Also make sure that the cleaner you choose is formulated for wood floors. Choosing a tile or vinyl floor cleaner can permanently damage your engineered hardwood floors. ​If you are opting for a more natural cleaner, then there are a few gentle cleaning products you can find in your pantry to clean. While Vinegar is a household cleaning miracle, it is not the right choice for engineered hardwood floors. The high acidity in vinegar, even when watered down, can strip your floors and ruin the finish. Again, don't use vinegar. Even though it can be a great option for cleaning carpets, you want to avoid it on your hard flooring. Instead of vinegar, try rubbing alcohol. You can choose from rubbing alcohol, denatured alcohol or a cheap vodka. The PH balance in this product is neutral, so it will not pose any harm to your flooring. Another great benefit of alcohol is that it will disinfect while cleaning. ​For a great homemade natural cleaner, mix half and half alcohol and distilled water (tap water can be harder and leave white marks), then add a few drops of Dawn. These gentle three ingredients will cut through dirt, grease and also disinfect. This is also one of the best methods for how to clean engineered hardwood floors without streaks. Finding the right cleaner for your floor not only takes care of the cleaning, it also takes care of the life of your floors. So before you grab a cleaner off the shelf, make sure it is compatible with your floors. ​Mopping is a great way to clean and refresh your floors. Once you have found the right cleaner for your floors then you can take this next step with confidence. However, when you are learning how to clean engineered hardwood floors with a mop​, there are some dos and don’ts that you will need to follow to keep from damaging them. ​Don’t skip sweeping before you mop. While it adds an extra task, sweeping is necessary to get up excess dirt and debris so that you aren’t smearing it around while you are trying to clean your floors. Note: a easy to use stick vac also does the trick! Do take the time to pick things up off the floor. Move small tables out of the way and set chairs in another room or on the table. If you are going to take on the task of mopping, then make sure you do a thorough job and don’t skip around furniture. ​Use a dry mop, otherwise known as a microfiber mops. These mops have special microfiber pads that will collect dirt and dust that your broom will miss. The microfiber is also soft against the floor and won’t scratch or damage it. In case you're wondering, this is not a mop that uses water or liquid. Instead, it gathers and collects dust that hardwood flooring naturally picks up. It will also pick up a few debris that your vacuum might have missed. Believe it or not, its best to stop here. Vacuuming and dry mopping your engineered hardwood flooring should be enough for the vast majority of debris, and if possible, you want to avoid putting water on it's surface. However, there will be times when your engineered flooring will need more care, and for that you'll want to use a wet mop. Don’t use a mop that is soaking wet. Using excess water on any type of wood floor (engineered or not) is a huge no-no. This is because excess amounts of water will be soaked into the wood and cause your floor to be damaged. Even though your floor’s finish deters water, it can still soak in over a longer period of time. Again, make absolute certain to squeeze the majority of water out of your wet mop before using it. ​After you mop, use a towel or paper towel to wipe up any excess puddles of liquid that is left behind. A damp floor is fine, but you want to avoid any pooling of liquid left on your floor. Open windows or use a ceiling fan to rotate the air and help your floors dry quickly. ​Engineered hardwood floors are meant to last almost a full lifetime. When you take the time to care for your floors, then you are extending their life. Investing in large area rugs for entryways and hallways can cut down on the dirt that can be carried in and spread in high traffic areas. Having a rug outside entry ways helps encourage people to wipe their feet before they come in. A second rug inside the door can catch excess dirt as they walk in. If you opt for a shoe free household then, this will also help the life of your engineered hardwood floors. Shoes can track in dirt and drop it in various places throughout the home. High heels can scuff and scrape away at your finish over time. There are many steps you can take in learning how to clean engineered hardwood floors. Each time you make an effort to clean or protect them is a step in the right direction to keeping your floors beautiful for years to come. Lauren Moldvay is a freelance writer from Virginia and the mother of one (not always) sweet little girl. She specializes in trying to help others find easier ways to clean, manage the home and save money with DIY projects.